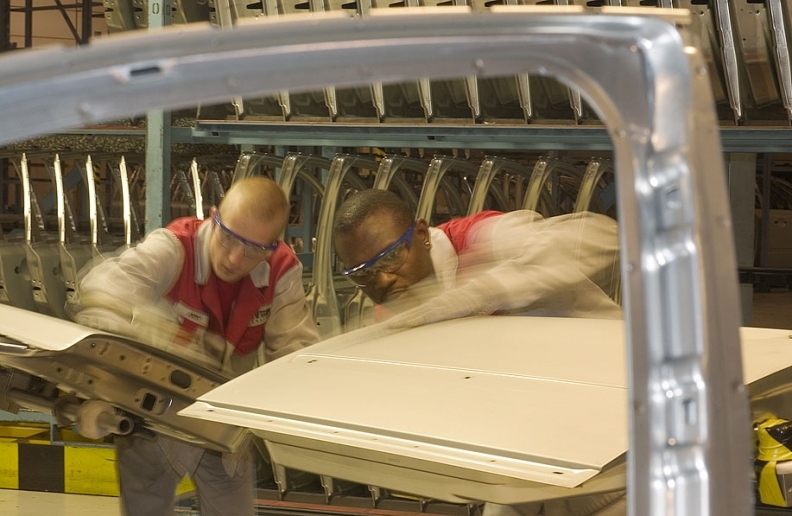 Workers conduct a quality inspection of front door assemblies at Tower's plant in Ghent, Belgium. DETROIT -- Longtime metal components supplier Tower International said it agreed to sell off its European division to a privately owned French automotive supplier in a deal valued at about $291 million. The company, based near Detroit in Livonia, Mich., said in a Friday statement that the stock transaction with Financiere SNOP Dunois S.A., or FSD, is contingent on regulatory approval, but it's expected to close during the first quarter of 2019. "Our European operations has been a difficult place for us to grow based on the fragmentation of the market [and] the lack of scale for us over there," spokesman Derek Fiebig said. "We're mainly in the central part of Europe. With FSD, the European operations, the combined entity would have a pan-European reach." In a statement CEO Jim Gouin said the company is poised for growth. "Since 2014, Tower's North American business has grown by more than 40 percent in a relatively flat production environment as we have benefited from the industry's shift from passenger cars to trucks and SUVs as well as OEM outsourcing," Gouin said. Tower is expected to book a $60 million loss from the transaction, due to currency translation, other adjustments and selling costs, according to a news release from November. In Europe, which represents a third of the supplier's revenue, Gouin said in July on a conference call for second-quarter earnings, sales dropped 0.2 percent for the third-quarter compared to last year. Total revenue grew 14 percent to $525 million for the quarter. The supplier's history stretches back more than 100 years to A.O. Smith Automotive Products Co., which was bought by Tower in 1997, according to the supplier's website. The first steel frame used on the 1903 Cadillac was invented by A.O. Smith. Tower ran into obstacles over the years, filing for Chapter 11 bankruptcy at the feet of rising steel prices, Automotive News reported in 2005. In 2007, it emerged from bankruptcy protection and private equity giant Cerberus Capital Management took control, Automotive News reported, but later sold its shares in the supplier in an $81.3 million initial public offering for 11 percent less than it initially paid for. Tower ranks No. 86 on the Automotive News list of the top 100 global suppliers with worldwide sales to automakers of $2 billion during the 2017 fiscal year.